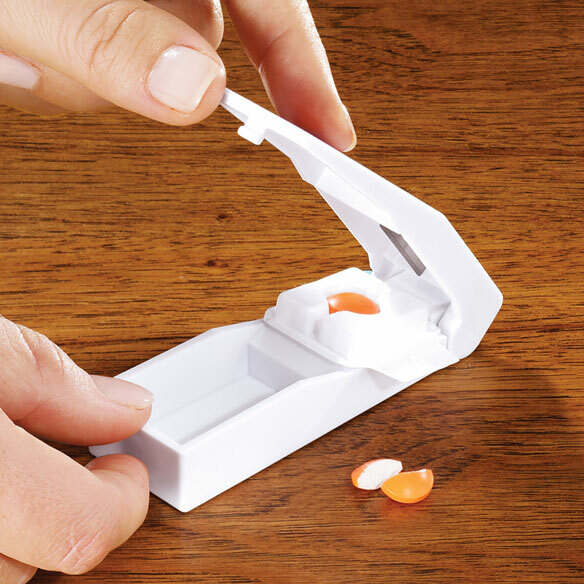 Painlessly split pills with the multi shape pill cutter. Includes trays for pills of all shapes and sizes. Plastic. 3 1/2" L x 1 1/8" W.
Does what it is supposed to do!! Works with any odd shape pills!! been looking for one, yea! I found it! When I got a little dog that needed medication, I was concerned because the pills wouldn't cut evenly. I didn't want to over or under medicate him. This is great. Down the middle each time. Now I have peace of mind. This is a well made Product. 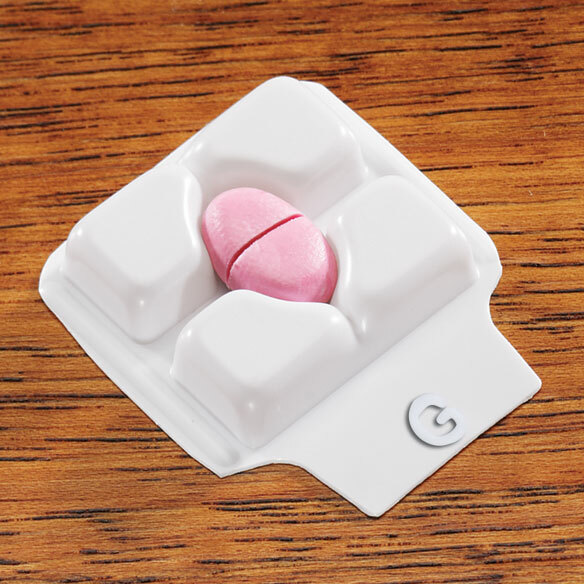 The different shaped inserts make cutting oddly shaped pills easy and precise. I really like the space to store the pills as I split them, makes it a little faster to do a lot of pills at one sitting. I am extremely happy with this device as it has saved me from crushing my expensive medications that I have to split in half as it is less expensive to get my medications in a larger pill and cut them in half to save money. This is a life saver as it also makes it so I get the amount of the medication distributed as needed in each portion as it cuts it in the size directly as needed. Solved my problem of those odd shaped pill that need to be divided. I have rheumatoid arthritis and it is so easy to find the correct tray for each pill I need split in half. This works very well for me. I recommend it highly. My husband even uses it for his medicine. My life just got easier! Just a bit ago my order of two Multiple Shape Pill Cutters (Item No. 317641) arrived and you need to know you just made my life as a caregiver quite a bit easier. My husband has Parkinson's Disease plus other ailments, so I help him by making sure he gets his medications. One pill, Sotalol, very tiny, had to be cut in half. The pill cutter provided by Kaiser Permanente was fine for round pills, but nearly useless for these long little fellows! After some fancy Googling I found your product and today it arrived, one for me, one for someone else. I am extremely pleased and I commend both the designer of the cutter and you folks for stocking the product. And you may quote me! Finally a cutter that works all shapes of pills. No more trying to center the pill and it moves. Quick and easy and a nice cut each time. Plenty of designs and sizes to choose from. Would have been nice if it came with a little hard plastic case though. 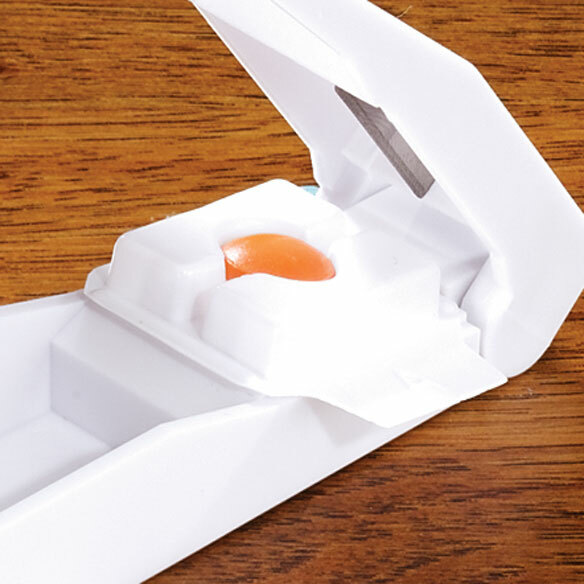 Much better than common one-size pill splitter, but doesn't accommodate largest and smallest tablets. The inserts are flimsy and don't stay in place well. For people with arthritis this pill cutter is a real boon. For those of us with hands that don't always co-operate and need to split our medication this item is a great help. I got it for my dad and sister who takes medicine bills that need to be split. It is very useful and easy to use. No complaints yet. This comes with a lot of different molds. There was one with the correct shape but it wasn't small enough for me. It still works, but it isn't a perfect fit. Easy to use. Requires minimum of pressure. Too many chices of pill shapes, probably will lose the extreas. Snaps shut, hard to open. Great price! Really love this. But unfortunately, did not have the template for the size pill that I needed to cut. Otherwise, love the variety of choices. Item is useful for splitting meds accurately, but is not made well, so it takes more time to cut the pills. Helpful in getting the correct dosage. It brakes my pills most of the time. Does not cut them. 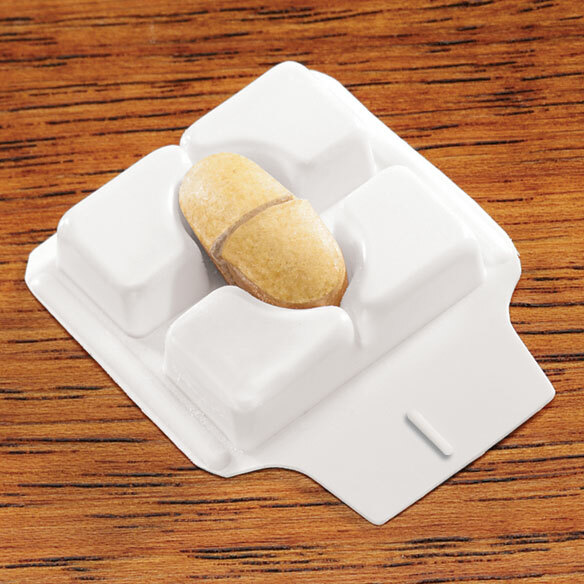 Trays don't hold pills properly so pill tends to fragment and not cut cleanly. Cutter is very difficult to open once cutting action is concluded. I was disappointed with the shapes provided. I purchased this because I have several pills that must be cut but don't have a groove in the center to get the most accurate cuts. None of the shapes provided are the correct size so this product is actually of no real use to me. I tried to use it for one of my pills but can't get a tight enough fit so the pills don't cut in the correct proportion. None of the shapes can hold a very large pill. I've had to go back to just using a knife. Not as safe as using a pill cutter. I wanted to split square pills. This splitter has several quite flimsy inserts, but none for a square pill. There were just too many parts to fool with. I threw it in the garbage after trying to half a large round pill and it broke it up. Does not work effectively. Too many flimsy plastic parts. sorry this pill cutter is worthless! Wonderful idea, but much too flimsy for general use. The cutting blade fell out with the first use cutting Calcium Citrate pills. Too many little trays to place pill in. Not as expected. The cutting part is okay, but to find the right pill tray for the pill that needs to be cut, is time consuming. Don't know how to use. Instructions incomplete. I'm glad this Pill Cutter didn't cost much, because it can't hardly cut pills safely. The pillholders do help hold pills better than just slipping them in and cutting, but I don't like it and would never buy it again !!! This cut my pills unevenly for about four or five pills and than started shattering them. This is a piece of junk. It supposedly has attachments that let you fit different size pills. The pill I tried was too big. I tried the "universal attachment" which was a piece of flimsy plastic. It broke. The blade on the cutter wasn't sharp enough either. The Pill Cutter is no good and it breakes up the pill. Instructions were unclear and cutter is ineffective. Doesn't have any of the size inserts that I need. It did not fit the size of pill that I had and it only works with a small variety of pills. What's not so great about it is that it "ssmushes" the pills rather the cleanly cutting them in half. WHY DO WE BUY FROM CHINA? Did not perform as stated. This is completely useless. Practically destroyed the pills I attempted to cut. I believe that the blade is not sharp enough/too thick. Don't waste your time. Pill trays are poorly shaped. Blade is dull it causes pills to shatter. Product is NOT RECOMMENDED. Flimsy. Cutting blade is unguarded. Doesn't have just a plain V pill form for odd shaped pills. Despite the numerous shape options, none fit the bill I needed to cut. This was the worst thing I have ever ordered it crushed my pills instead of cutting them. I trashed it as it cost more to send it back than it was worth. The pill cutter was not easily understood and very flimsy. I threw it away. I was very disappointed in this pill cutter. The description mentioned being able to cut all pill shapes but did not explain "how." This cutter comes with flimsy plastic inserts to account for vaious pill shapes but still did not accommodate my specific pill needing to be cut in half.....instead I got a crushed pill.....5 times, and then I stopped trying. This nmay have been due, in part, to the fact that my pill has a rather "soft" texture, but I feel that this should be highlighted in the product description. For my pill, this cutter worked worse than the one I already own. I will be returning this. I'm on several medications, so this looked like just the ticket for splitting one of my larger pills. None of the trays was large enough to hold this pill, and the first time I tried to use this splitter, the top broke off of the bottom. Pricey garbage. This JunK! It crushes the pills. thought this would help in spliting pills---it crushed every pill we tried. This item was worthless and would send back if postage were not so much. Poorly made. It lacked one of the cutting shapes it was supposed to have. It was very hard to open & close. It was just a piece of junk. Save your money. Need variety of shapes for 2 users. It seems like a good idea! Need cutter for different shapes. It fits my needs and is good price. Although I have a basic pill cutter I now need to cut a rectangular pill and my cutter doesn't cut them equally. 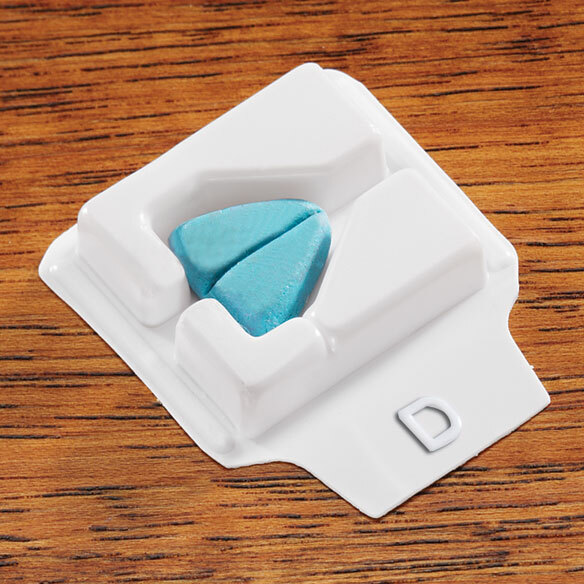 I am looking for a pill splitter that actually will split the pill in half, rather than crushing them. Because my husband & I take many different shaped pills & I thought this looked like what I have been looking for to cut some of the medication into. makes easier cutting than standard brand That IS JUST A RAZOR BLADE. Need it to split my pills in half. I have pills with no score strips and of different sizes! And for my animals too! my pill has 3 different parts to cut how would I cut them with this cutter ?